Using the work of Toyo Ito as a connecting thread, this lecture will trace the evolution of Japanese architectural theory and practice over recent decades. The spatial, aesthetic, and behavioural concepts that underly the buildings will be elucidated by situating them within a wider cultural context of art, economics, politics, and technology. 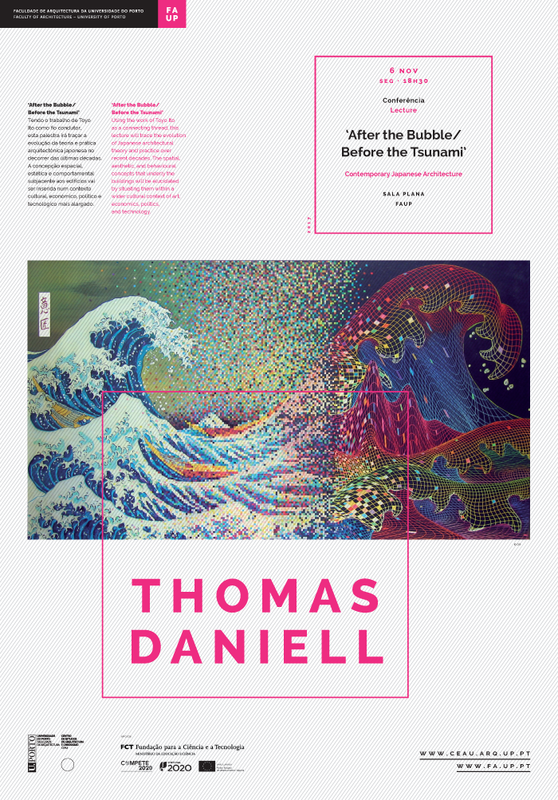 Thomas Daniell is Head of the Department of Architecture at the University of Saint Joseph, Macau, prior to which he spent twenty years as a practicing architect in Japan. He holds a B.Arch from Victoria University of Wellington, an M.Eng from Kyoto University, and a Ph.D from RMIT University. His publications include of FOBA: Buildings (Princeton Architectural Press, 2005), After the Crash: Architecture in Post-Bubble Japan (Princeton Architectural Press, 2008), Houses and Gardens of Kyoto (Tuttle, 2010), Kiyoshi Sey Takeyama + Amorphe (Equal Books, 2011), and An Anatomy of Influence (Architectural Association, forthcoming 2018). Free entrance (up to the room's capacity). Organization: Ana Neiva (within the research group - Housing architectural design and forms of dwelling, research project 'Narrativas do projecto educativo em Arquitectura', CEAU-FAUP).